Costa Canyoning is Costa Ballena's premier canyoning company. They provides you with waterfall rappelling adventures like no other available in Costa Rica, and give you the opportunity to enjoy the experience of a lifetime while exploring Mother Nature's tropical fun park! We offer the most extreme adventure activity in the Uvita, Dominical and Ojochal areas known as Costa Ballena. 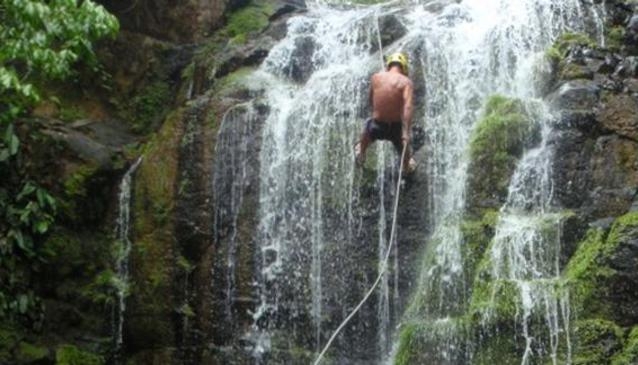 Costa Canyoning has 6 waterfalls which we rappel in succession from smallest to biggest. The biggest waterfall is a heart pounding, adrenalin pumping 80 ft. waterfall that drops into a natural swimming pool. No experience is required. We will teach you everything you need to know but you need to be somewhat agile and have an adventurous spirit. Kids 11 years old and up are welcome and will surely love it and talk about their canyoning experience for many years. Our head guide Scotti, has over 11 years International Canyoning experience, working in Switzerland, France, Italy, New Zealand, Japan and now Costa Rica. He is a great guide that you will make you feel comfortable as you learn this amazing sport. Costa Canyoning suggests that you wear clothes that you don't mind getting wet and dirty. Please also wear a pair of sneakers or adventure sandals - please NO FLIP FLOPS! After an amazing day of adventure and canyoning we provide fresh fruit, fresh salsa and chips, and a beverage of your choice for lunch. We will take photos of you canyoning down waterfalls, swimming in natural pools, and playing in the jungle. These photos are included in the price of $95 dollars per person. Please use the email button on the right to contact us and reserve your spot today.